COLORADO SPRINGS, Colo. - The United States Olympic Committee today announced finalists for the Team USA Awards presented by Dow, Best of May, which recognize the outstanding achievements of Team USA athletes from last month. Fans are invited to vote for their favorite athletes and teams at TeamUSA.org/Awards through midnight Tuesday, June 5. A total of eight sports - including fencing, ice hockey, Para-cycling, Para swimming, paratriathlon, rugby, swimming, and track and field - are represented among the 13 finalists across men's, women's and team categories. The finalists' collective accomplishments tell the inspiring story of U.S. Olympic and Paralympic athletes year-round. Dominated the men's PTS2 race with a time of 1:07:17 to win gold at the world series event in Yokohama, Japan. Secured the top spot in the MH2 world cup rankings after winning gold medals in both the road race and time trial, and helping the handcycle relay team win silver in Ostend, Belgium. Earned the No. 1 world ranking in foil after winning the individual bronze medal at the grand prix in Shanghai, while also guiding the U.S. men's foil team to the gold medal and No. 1 world ranking at the world cup in St. Petersburg, Russia. Named MVP of the 2018 IIHF Men's World Championship, setting U.S. single tournament records in points (20) and assists (12) in leading Team USA to the bronze medal. Shaved three minutes off his personal best and recorded the second-fastest marathon time ever for an American (2:06:07) in his win at the Prague Marathon. Improved her world record in the 1,500-meter freestyle, while also posting the second fastest 400 freestyle time and the third fastest 800 freestyle in history at the Pro Swim Series in Indianapolis. Claimed three individual medals and one relay medal, setting four American, three Pan American and one world record at the World Para Swimming World Series in Lignano Sabbiadoro, Italy. Covered the sprint-distance course in 1:17:39 to win the women's PTS2 class by more than a minute and a half at the world series event in Yokohama, Japan. Captured the gold medal in road race and the silver medal in time trial at the world cup in Ostend, Belgium, climbing to the top of the WT2 world rankings. Defeated the 2016 Olympic champion en route to winning the saber bronze medal in Moscow, giving her the most career grand prix medals (27) for any women's saber fencer in the world. The team of Miles Chamley-Watson (New York, New York), Imboden, Alexander Massialas (San Francisco, California) and Gerek Meinhardt (San Francisco, California) became the first U.S. team to sweep world cup events in a single season after winning its fifth straight title in St. Petersburg to maintain its No. 1 world ranking. Won the bronze medal at the 2018 IIHF Men's World Championship with a 4-1 victory over rival Canada, leading all nations with 46 goals in 10 games. 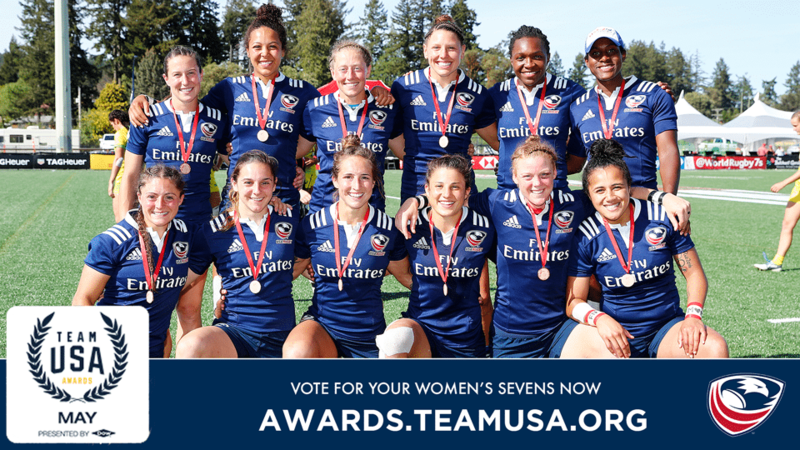 Earned the bronze medal at the HSBC Canada Sevens tournament, marking the first time the U.S. women have earned medals twice in a single season.